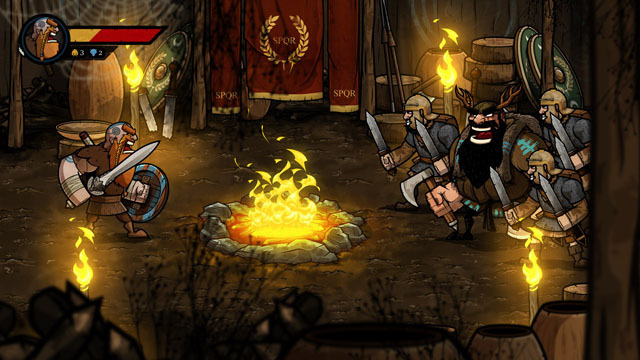 Wulverblade, from Darkwind Media and Fully Illustrated, is a sidescrolling beat 'em up taking place in Britain in 120 AD. You control one of a pair of burly bearded men with swords and shields - or badass woman named Guinevere - who brutally slash their way through opposing armies, spraying blood across the battlefield. Battle your way though the rolling hills, forests, caves, cities, and enemy fortresses taking down enemies and bosses with a variety of melee weapons. Locales and certain key characters are based on their real world counterparts, and the game is presented in a dark illustrated style. Go it alone, or team up with a local companion for 2P co-op. The game is headed to PC, Mac, Linux, and Xbox One later this year.